This Is Your Captain Speaking: What's Up with the Rollercoaster Takeoffs from Orange County? What's Up with the Rollercoaster Takeoffs from Orange County? 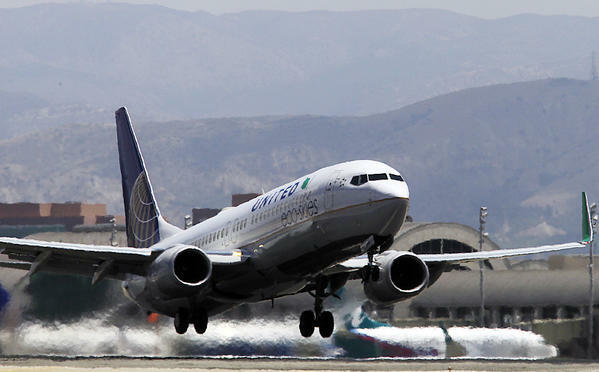 If you've ever had the pleasure (or perhaps the terror) of taking off in a commercial plane from Orange County's John Wayne airport, you'll know that it is a takeoff unlike any other. Just seconds after liftoff, you will feel your stomach drop as the airplane does a very abrupt pushover. This pushover, similar to what you might feel on a rollercoaster or perhaps a hilly backcountry road, will make you light in your seat. You might even feel yourself being restrained by your seatbelt. The next thing that you will notice is that the sounds in the cabin will change. Specifically, they will get much quieter. The roar of the engines that accompanies all takeoffs will diminish dramatically. You will sense that the nose of the aircraft has dropped significantly. The incline, or what pilots call the "deck angle" will have gone from the usually steep angle used for most takeoffs, to one that is barely distinguishable from level flight. And all this will seem to be happening much too close to the ground. Finally, you may become aware of an annoying thumping that you feel in your chest. Don't worry, that's only your heart pounding. You may think that this is it...game over...and wonder if there's enough time to squeeze a goodbye text to your loved ones before plunging into the Pacific ocean. But you should rest easy. You are not going to die (at least not today). What you have just experienced is known as a noise abatement takeoff. They occur hundreds of times weekly at John Wayne and are an FAA approved and in fact government mandated maneuver. That's right; pilots and airlines will be fined if they don't perform this type of takeoff. So why, you may ask, are you being subjected to an experience that should probably be featured at the nearby Disney theme park? Well, as I mentioned above, noise. Noise and of course politics. For John Wayne airport is the only airport which mandates such a drastic noise reduction profile. And as legend has it, the Duke himself, the airport's namesake, had a hand in getting those restrictions put in place. The departure path from John Wayne airport flies almost directly over Newport Beach. And as you may know, Newport Beach is a very well-heeled community. And while I'm not going to make judgements on wealth accumulation, one thing wealthy people are good at is getting things done. Starting with the arrival of the first turboprops and jets in the 1970s, community activism followed soon thereafter. Eventually lawsuits were filed and the restrictions were put in place. So knowing why airplanes have to fly quietly, you may be wondering about the "how". And specifically, you might be wondering why airliners don't just use less thrust from the get-go instead of the roar followed by the pushover and silence. Without getting too technical about takeoff performance, much of it comes down to the runway length at John Wayne airport, or to be more specific, the lack of runway length. It is the nature of gaining flying airspeed in a very short distance which necessitates the full power takeoff. Once airborne, but before the flaps are retracted, the aircraft reaches a "cutback" altitude of about 800 ft. It is here where the engines are throttled back either manually or by the auto-throttles to a thrust which meets the minimum required climb gradient of about 2.5%. Less thrust also means a shallower climb angle, hence the pushover. I suppose that depends on your definition of the word dangerous. Any time you monkey around with large power changes on a turbine engine, you increase the odds of something going wrong. In fact, many engine failures occur not on initial thrust application such as takeoff, but rather on a large thrust reduction. That said, the odds of that ever happening are infinitesimal. Still, it isn't unknown for engines to fail as was dramatically illustrated by the uncontained engine failure on a Southwest Airlines 737 several weeks ago. Infinitesimal odds, but not zero. So no, it isn't dangerous in the conventional sense of the word. Avoiding flights out of Orange County to avoid takeoffs using this procedure would be silly. And likely more dangerous as a longer commute up the freeway to LAX would definitely expose you to more absolute danger in your car. Of course, the safest course of action is to hide under the bed which still won't protect you from meteorites...or dust bunnies. So when you do get on that airplane leaving the OC, be sure to get a window seat on the left side of the airplane which gives the best views of Catalina, relax and enjoy the ride. But don't put your arms in the air and scream as if on a real rollercoaster. People will stare.